A re-release of Stephen Frears’s 1987 drama about Joe Orton, the blackly satirical and dead funny writer of Loot and Entertaining Mr Sloane who was battered to death by his lover Kenneth Halliwell in their rundown London flat in 1967, just as the big time arrived. It’s a study of a relationship skidding towards the brink, with Gary Oldman a chirpy, cocky Orton, Alfred Molina working hard at the much less sympathetic role of Halliwell, the older man whose tutorial services were no longer required once Orton’s star started to rise. Meanwhile Vanessa Redgrave puts in to-the-manner-born performance as Orton’s imperious, patrician, rather scary agent, Peggy Ramsay. 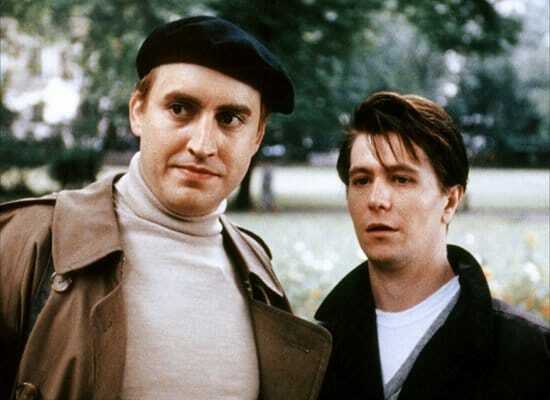 The film seemed almost daring when it debuted in 1987 – the accent being on Orton’s homosexual behaviour. It seems less so now. In fact it threatens to dissolve here and there, so one-ply does Alan Bennett’s screenplay become at times. But you can’t deny the fruitiness of Bennett’s whimsical, playful excursions into Ortonese, and the two main performances are stonkers – this was the era just after Gary Oldman had erupted in Alex Cox’s Sid and Nancy; whereas Molina is so endlessly versatile that his acting ability is often overlooked. Together the pair flesh out the bare bones of the scandal of Orton’s death (and life, for that matter). There was more to the man than where he chose to park his private parts, after all. So yes, the “Ears” of the title is probably an anagram.